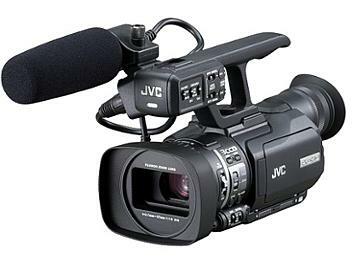 The JVC GY-HM100 is a compact handheld memory card camcorder with performance and features found only in larger and more expensive models. It's designed to be easy to use, making it ideal for news reporters and producers. Excellent camera, we use it for cut a ways often during a live switch, also brilliant when you have to get into those tight places. It is Great first camera for those wanting to start out. I have been using a different brand camcoder and I decided to get a new camera. Googled a few and I saw the statements that this one gives you quality that you normally get from bigger cameras, etc. I took a chance, keeping in mind that this was probably written by the same guy who made the camera. Just told myself he is too taking a risk because if what they say is not true.... I'm not sorry. I'm getting value for my money. Yes I struggled a bit because I use ADOBE, but I figured out that I set the camera to MP4 and all is well. This is an excellent vidéo-camera really useful for many situations. A good pictures quality, and a very productive workflow with the recording on the SD-Cards. At this price you can't find a better camera. Received the camera 2 days after paying for it.Took the camera to Japan for 5 weeks filming a documentary. Carried the camera in a backpack over mountains,thick forests,narrow trails,rain,etc. Used 2 x 32GB class6 SDHC cards which I downloaded to a notebook computer on a daily basis. Recorded at 1920x1080 and the picture quality was great even in thundery rain. However a 15-20 times zoom lens would have been an additional plus. Even due to the vulcanic ashes closing the european airspace, I got my order delivered in time. I'm also thankfull to FEDEX in Oslo, Norway for not delaying the shipment unnessassarily. Global Media is excellent place to do purchases, I've learned. Shipped and bought the 21 of april i got it the 30!!! Commander et payer le 21 avril arriver le 30 at home!!! Super service de Global media Pro. SUPER reçu rapidement camera de très bonne qualité faire attention pour les douanes ils se trompent souvent de monenclature il faut donc les surveillés. global media pro excellent pour vos tarifs. Je n'ai hélas pas eu encore le temps de la travailler en toutes conditions mais je peux d'or et déjà dire que c'est une très bonne affaire ! A ce prix, elle permet d'envisager des docus pro en laissant des fonds pour acheter de bons micros car celui qui est fournit est un modèle de base. Je vous conseil aussi le grand angle canon qui est disponible pour pas cher. Great transaction. I received the camcorder in less than 2 weeks in France. Camcorder is running great - I knew this camcorder - so no surprise on this side. if you should buy one of these - do it! It's great. the results are fantastic for such a small camera!